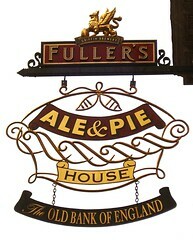 Fuller's Ale & Pie Houses are a sub-brand of Fuller's pubs. They all offer cask-conditioned Fuller's ale as well as traditional-style pub food including (unsurprisingly) a selection of pies. The menu for each venue is designed by the pub's own chef in collaboration with the Ale & Pie executive chef at Fuller's HQ. Each pub has its own "signature pie". Info on menus taken from email exchange between Kake and Tony Johnson at Fuller's, mid-2008. Last edited 2008-12-17 12:51:20 (version 3; diff). List all versions. Page last edited 2008-12-17 12:51:20 (version 3).